Thanks for your enthusiasm for our event yesterday. We are recycling “lost & found” items back to their owners - think of them as draw prizes! Contact Jo at moc.duolci|ojnnul#moc.duolci|ojnnul. Track setters have completed their work today following some fresh show from LL to Castle and a little rain from Castle to Banff. Yep, this is January. We think we have a very good course for you tomorrow. More details at the 0730 meeting, but apart from the great track expect leg1) an 800m run up Morants Curve, leg 3) mixed snow and icy track between Castle Lookout and Castle Junction, legs 4 and 5) track set periodically on the dirty snow banks, leg 6) after leaving the Healy/ Cave and Basin trail (skate and classic), there is about 800m of hard packed ski trail where it was not possible to groom or set track. Still skiable. Grooming and track setting resume on river to finish. Follow the orange LLBL flags! Remember Oscar Wilde’s words as you push through your leg(s), "Everything is going to be fine in the end. If it’s not fine, it’s not the end”. 1) Some portions of the ski trail near the road are gritty. Older skis and larger pole baskets are advisable. Stone grinding of bases is provided free of charge. 2) To speed the verbal transfer of checkpoint times, we will be recording times to the nearest minute, not seconds. The finish line (end of leg 6) will record to the nearest second, lest there be sprints! 3) end of leg 3: the final 500m of Johnson Canyon Campground road has been plowed by contractors. We will know on Saturday if sufficient new snow has fallen for a track to be set. Else skiers can run to the checkpoint. 4) skiers beginning leg 6: Carrying your skis and poles, you must run across the Sunshine overpass into the Healy Creek parking lot and begin your ski leg there. You may not climb over the highway barrier to access the trail early. A volunteer will direct you into the parking lot. Leg 6 will be set for skating and classic. Check back for a final update on Saturday evening. Start your taper. Really. Crews have been busy today and most of the 72km course has been track set and is ready for your dining and dancing pleasure! What has been packed but not set is from Muleshoe rail crossing (leg 5.5) through the Backswamp to the Sunshine overpass (end of leg 5) and the river into Banff (second half of leg 6). We anticipate resetting the entire course on Friday or Saturday next week. In the meantime, get out and enjoy the course. Start your taper, and if not, start your training! Thanks to Mountaineer Lodge in Lake Louise for special loppet rates at their hotel. This weekend crews have been busy sledding from Castle Junction over the Hillsdale Split and on to Muleshoe (legs 3.5 to 5.5) packing the trail in preparation for track setting next weekend. Great snow this year! As well, next weekend we will prepare the Backswamp trail to Sunshine (leg 5.5 to 6). As shown below, we are still perfecting a new technique of banking the corners! Trail crews began snowshoeing and fat-skiing the course this weekend and it is looking great! We will begin skidoo packing sections next weekend when we receive our Parks permit. In the meantime, we remind you that the deadline for cancelling your spot from the loppet and receiving a $35 refund is midnight, Friday, January 8. If any cancellations are received, we will offer those positions to skiers on the wait list. Start your taper. We have now closed the waiting list. Thanks to everyone for your interest in the race. The hardest part of the loppet is over. Getting in! If you can ski as quickly as you can enter data, we have to get more awards. If you were unsuccessful, please email ac.teppol|ofni#ac.teppol|ofni with your details (name(s), category, age(s), an email contact) and we’ll add you to the waiting list. No guarantees, but each year there are some spaces that open up. Registration opens tomorrow morning (Saturday, December 5) at 8AM sharp on Zone4. Here are a few tips to help you speed through the process. We are planning a full 72km race this year with 6 legs for solo skiers or teams of 2-6. The loppet cost is $59 per skier regardless of how many legs, which includes Zone4's credit card and processing fees. Teams: One person (Team Captain) must sign up all team members at the same time under the same registration transaction, paying for everyone and then getting them to reimburse you. Solo AND Team skier: A solo skier can also ski leg 1 for a team at no additional cost as long as are include in the team registration. Make sure to select solo category as well as team category on registration. It helps us greatly if you can enter all of this info at registration time but if you are unsure of any of the details, use your best judgement. Mixed Teams: To be eligible for Mixed Team awards, the team must be one third or one half opposite gender. To recognize nordic skiing as a "life sport", new this year is an additional category for solo male and female skiers who are 65 or older. If you do not secure any of the 200 places for the 2016 loppet, please email us at ac.teppol|ofni#ac.teppol|ofni with your name, phone number, category and number of skiers. We will create a "waiting list" and do our best to find you a place. Loppet registration will open at 8AM on Saturday December 5th! Mark your calendars and stay tuned for more details. Welcome back to the 2016 loppet! Planning is underway for a full length Sunday, Jan 24 departure at 0800h. Our backup date due to snow conditions or frigid temps is Sun, Jan 31. On-line registration details to follow. Ready Freddie?! Forecasted temps for the Lake Louise start on Sunday are -9C overnight and -7C at the 0900h start. The Sawback finish area might be just below 0C. Where there are diverging trails on the loppet course, orange flagging will be used to mark the loppet trail. Leg 1: Passing under the TCH overpass, skiers will need to gingerly ski across the snow covered rocks. Later, exiting the trail at Morants Curve skiers will need to walk/run 900m up the road and rejoin the trail on the right. Insufficient snow on the road or snowbank prevents us from setting a track. Leg 2: It doesn't get any prettier than this! Leg 4: Crews have set an uphill track on the Hillsdale Split and a track on low sloping downhills. A groomed trail without a track is set on the steeper downhills. Due to challenging terrain, some of the trail is on top of flattened snowbanks containing winter road debris. As previously posted, if possible, it is best not to use your primo skis. This event offers free stone grinding of ski bases on Leg 4." Package pickup at the Chateau (bottom floor of Conference Centre) beginning at 0800h. Pre-event meeting at 0830h. The entire 50 km track is in! (Well, almost!). Volunteers set a track from Castle Junction to the finish at Sawback this afternoon. The remaining short section on Leg 1 between Lake Louise campground and Morants Curve will be set early this week. We anticipate the entire course will be reset again at the end of the week. The Moose Meadows portion of Leg 3 is very 'willowy'; volunteers have been snipping as much as they can. On Legs 3 and 4 there are a few 100-200m stretches where we had to set track on the snowbank beside the road. Road debris is evident and skiers are advised not to use their primo skis, if they have a choice. A final track report will be posted on Friday evening. Various crews have been out packing and pruning portions of the trail. Leg 1: ParksCan continues to trackset trails down to LL campground. Baker Creek will be track setting from LL campground to Baker early next week. Leg 2: Baker Creek has track set from Baker to Castle Lookout. It's fantastic! Leg 3: Castle Mountain has trackset from Castle Lookout to the Junction. The remainder of Leg 3 and all of Leg 4 will be trackset tomorrow. We anticipate that all portions of the loppet trail will be reset at the end of next week. As in previous years, we anticipate there will be short sections along the 1A/Bow Valley Parkway that are not tracked (terrain or snowplow affected) and skiers will be advised to take their skis off and run or walk. No snow and mild temperatures in the forecast for next week. Start your taper! Yippee-yahoo! Snow is falling on the course, volunteers have snowshoed the always interesting Hillsdale Split and sleds are out packing the trail prior to track setting. We hope that 'all systems are go' for you but if you need to cancel, please email us at ac.teppol|ofni#ac.teppol|ofni before 6pm, Friday, Jan 9. We will refund you $35 and extend your place to a skier on the wait list. Space is available on our 0700h shuttle-bus to the start. Cost is $10, paid at the bus; please email a request. Change facilities and showers are available at The Banff Centre's Sally Borden Building beside the reception. Just show your bib ($2 towel charge). Please check back periodically for future updates. In the meantime, apply one final coat of pine tar to your wooden skis. We have closed the wait list. If your name is already on the wait list we will update you as we get closer to race day should anything open up. Thanks to Mountaineer Lodge for special race day rates at their hotel. Available January 16, 17 & 18, 2015. Double occupancy. We will accept additions to the wait list for a short period. Please email ac.teppol|ofni#ac.teppol|ofni with details and we will confirm that you are on the list. The race is almost full. 21 spots left as of 8:50am. Registration opens tomorrow morning (Saturday, December 13) at 8AM sharp on Zone4. Here are a few tips to help you speed through the process. The loppet cost is $55 per skier regardless of how many legs, which includes Zone4's credit card and processing fees. The optional bus shuttle from Banff to the start of the race is $10 per person. Note that the shuttle from the finish line at Sawback to the Banff Centre is free and will operate first come first served, no registration required. You will need to give your team a name. Your team is not required to ski the legs in the order you register the team skiers. Mixed Teams: To be eligible for Mixed Team awards, the team must be 50/50 male/female so either 2 skiers, one male and one female each skiing 2 legs or 4 skiers, two male and two female each skiing one leg. Leg 2 from Baker Creek to Castle Lookout is 'open for business'! The Alberta World Cup Society is hosting the NorAm Western Canadian XC Ski Championships at Lake Louise on January 15 and is looking for volunteers! Click http://www.albertaworldcup.com for further information. The flood damaged Healy Creek bridge and trail will not be reconstructed before the upcoming loppet. Hence, the loppet will finish at the Sawback Picnic area on the 1A. (50km, 4 sections, up to 4 relay members). Shuttle service from the finish to Banff will be provided by the organizers. Start your taper. Pending Parks Canada approval, the 2015 loppet will be held on Sunday, January 18 (backup date Sunday, January 25). At this time we are not sure whether or not the Healy Creek bridge (leg 6) will be reconstructed this winter in time for the loppet. This will determine if the 2015 is (again) 50km or 72km. Prior to on-line registration opening on December 13th (8:00), we will provide a course update. Welcome back to another loppet! Here is the final trail update. Leg 1: starts on the lake at 0900h; multiple, parallel tracks will be set tomorrow morning, leading to two tracks off the lake. Expect crusty conditions exiting the lake. Morant's Curve needs to be run up because a track could not be set on the berm. Leg 3: about 2 km after Castle Lookout, two descents on icy, narrow trail require caution when skied. Leg 4: Hillsdale Split uphill is track set and can be fully skied. Some low angle portions of downhill have been track set. Steeper portions are groomed but not set. Skiers can exit onto road and run down the Split if they so wish. Package pickup begins at 0800h in the Chateau's Plain of Six Glacier/Saddleback conference room. Pre-event meeting at 0830h. See you there! Ready, Freddy?! We nearly are! Volunteer crews have been packing and pruning the trails over the last two days. Smooth as a baby's bum. (Well, almost!) Final track setting will occur on Friday and Saturday. High winds and warm temps have not had a significant effect on the trails, though pine needles are frequent. Don't ask us how to wax for them! No new snow is forecasted. Sunday temps: LL overnight -5/morning -4, Banff overnight -5/ afternoon +1. Leg 1 skiers should anticipate running up the road at Morant's Curve. Insufficient snow on the barrier prevents a track being set. Leg 4 skiers should anticipate skiing and/or running on the road on parts of the uphill or downhill portion of the Hillsdale split. We will know more by Saturday after seeing if any additional snowplowing affects our preferred track setting route. Please continue to check this website for further updates. A final update will be posted by 1800h Saturday. Excellent snow cover over the entire 50 km course…Loppet track is set from Chateau through to Castle Junction (legs 1, 2 and first 4 km of leg 3). Volunteers will be out this weekend to machine pack from Castle Junction to the finish at Sawback. We expect to set track on this portion through next week. Snow in the BNP weekend forecast. Come out and ski any of the first 35k. Or have you started your taper already?! If for any reason you will be unable to use your spot at the 2014 Lake Louise to Banff Loppet & Relay you have until midnight tomorrow (January 5th) to let us know and receive a $35 refund. Please let us know if you are unable to attend and we will offer your spot to someone on the wait list. Loppeteers! The Mountaineer Lodge in Lake Louise has joined us as a sponsor and is offering a great b&b rate. Mention the Lake Louise to Banff Loppet for their special rate. A standard room will be $116 plus taxes, which includes breakfast. Registration is full and we have closed the wait list. If your name is already on the wait list we will update you as we get closer to race day should anything open up. Just a reminder that this year, due to flood damage, we are running a shortened course with 4 legs ending at Sawback. We can accept solo entries or teams of 2, 3 or 4. If you are registering a team you must register the whole team at the same time under one transaction. Once we have reached our capacity we will open a wait list in case there are any cancellations. To join the wait list please email us at ac.teppol|ofni#ac.teppol|ofni with your name and number of skiers, category and contact information. 1) The loppet will end at the Sawback picnic area (end of leg 4, 50 km), where we have previously finished in "low-snow" years. 2) A periodic bus shuttle will be available at the finish to bring skiers to the Banff Centre throughout the afternoon. No charge. 3) Start time in Lake Louise is 9:00 am, not the usual 8:00 am. Time for an extra cup of joe. 4) Teams can have up to 4 skiers. Mixed teams are made of 2 male and 2 female. 5) With reduced teams of 4 and a compressed time to compute results (see #7), we have removed the option of individual skiers also skiing the first leg for a team. 6) The usual cut-off time for the end of leg 1 (Baker Creek) remains 2.5 hours. 7) With the shorter distance, the awards reception at the Banff Centre will be at 4:00 pm instead of 5:00 pm. With the shorter distance, we hope many of you will consider skiing the entire 50 km. Think of it as training for the 2015 full distance! Other event information can be found on this website. On-line registration opens at 0800h on Sunday, December 15. Have your credit card warmed up. It's our version of a Black Friday sale! Welcome to the 2014 Lake Louise TOWARDS Banff Loppet and Relay! What we know…first, the loppet date is Sunday, January 19 with an alternate date of Sunday, January 26 (due to snow conditions or cold weather), second, on-line registration will open up on Zone4.ca website at 0800h on Sunday, December 15. What we don't know…where will the loppet finish? Details, details! Leg 6 (Healy Creek trail from the Sunshine Road to Banff) received significant damage in the June floods. The bridge was washed out and major trail erosion occurred further along the trail paralleling the creek. It is anticipated that the trail will be repaired in Spring 2014. The Sunshine Road overpass is not a safe location to end the loppet after Leg 5, so your organizing committee is putting on its collective thinking cap. Possible locations to end the loppet are at the end of Leg 4 (Sawback picnic area, 50 km, and previously used in low-snow years) or midway along Leg 5 in a suitable spot. An announcement of the finish location and the number of legs (important for relay teams) will be posted on our website by December 1. Team results and splits have now been posted, thanks for your patience everyone. Sorry for the delay. Solo results are now posted. Team results will be posted later today. As coverage allows, we will post photos from the course during the 2013 Lake Louise to Banff Loppet & Relay. Leg 1: access the starting tracks from the LEFT side of the lake (well away from the ice castle skating rink. There is slush under the snow behind the ice castle. Stay straight on the main tracks through the campground (there are tracked loops that veer off right and left. Pine needles have blown down on parts of their trail towards Morant’s Curve. A wide tracked skiable berm sits above the road at Morant’s Curve – skiers can elect to run on the road. Leg 4: Report are there is just one hill. Skiers may choose to run on the road on the downhill portion. It is packed wide enough to snowplow. Leg 5: After the Muleshoe rail crossing, there is a little slush showing for about 100m. Reports from “Skier Bob” Truman indicate you are best to stay on the packed track rather than veering off. Leg 6: Set for classic and skating. After exiting the Healy Creek and Sundance trails, skiers drop onto the Bow River for the last 2 km to the finish. There is 300m of wet track that we are hoping will freeze overnight. Crews will be resetting the track in the morning, but skiers will probably have to ski without a track over this section. Large pole baskets and a scraper are recommended for these legs. Please remember that someone from each team will need to pick up the team's race bibs from The Chateau Lake Louise tomorrow morning unless the leg one skier is prepared to distribute them down the line in which case you will obviously have a bit of a time delay. This is of particular note for teams that have a skier skiing solo as well as for their team. Registration will be at 7:00AM in the Plain of Six Glacier/Saddleback room which is downstairs in the Conference Centre wing (same place as last year). A race briefing will follow at 7:30AM. We will post a further update this evening outlining any course issues etc. We still have room on the shuttle bus so please let us know if you'd like to register. $10 gets you a ride from Banff up to Lake Louise for the start of the race. The race registration pickup will be in The Plain of Six Glaciers/Saddleback rooms which are located downstairs in the Conference Centre wing at the Chateau. This is the same location as last year. Two sleds have run over the course today from Castle Junction to the Muleshoe rail crossing. It will be track set Friday or Saturday. Poles with larger baskets than what you might use on pristine, packed corduroy are recommended! Jo and Dave complete the first recorded alpine ski traverse of Moose Meadows. 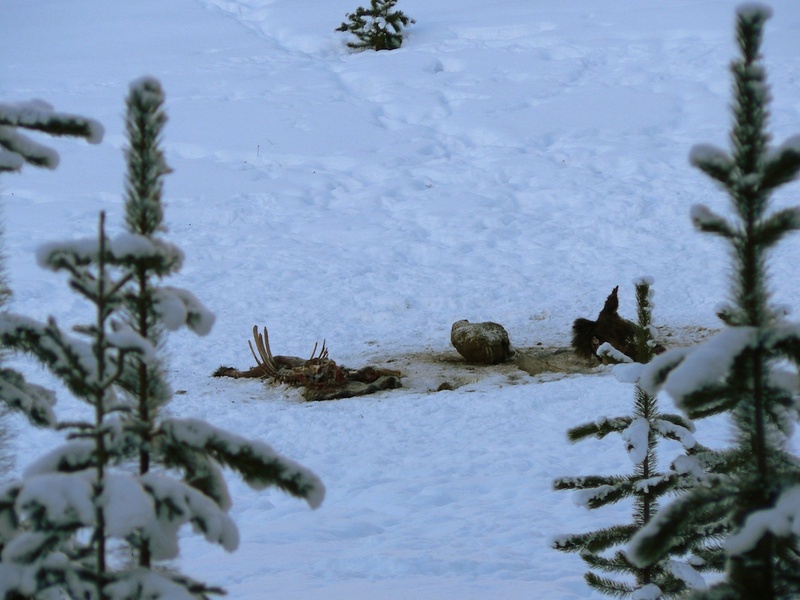 Avalanche conditions were considerable, but the pair traveled without incident! For this year's loppet we appear to be blessed with plenty of snow and a warming temperature trend through the final week. The track has been packed and set from the Chateau to Castle Lookout and many skiers were out this weekend enjoying legs 1 and 2. From Castle Lookout to the Sunshine overpass (legs 3, 4 and 5), crews have been out in the past few days snowshoeing and wide-ski packing the trail to help it set up for sled packing and then track setting. There is a lot of snow out there! Tracksetting legs 3, 4 and 5 will occur this week. Leg 6 (Healy Creek trail and the Bow River) have been set, but will be reset during the week. 1) mid leg 3: At one of the 1A parkway pull-outs, snowplowing has meant skiers will have to ski/run along the road for 100m. 2) end leg 3: Entering Johnston Canyon Campground, utility contractors have plowed the campground road for the last km to the checkpoint. It is uncertain at this time if a track can be set over this section. Sufficient snow covers the road for skiers to skate ski. Additional updates will be posted as needed. Unfortunately, as the Chateau is virtually sold out for the Ice Magic weekend of Jan 19 and 20, there is no preferred room rate for participants in the loppet. Please seek accommodation with the other hoteliers in Lake Louise, Baker Creek or Castle Mountain. Tracksetting is underway and things are looking good! January 6 is the deadline for cancellations with a full refund. We have lots of people on the wait list so please contact us by midnight Sunday if you decide to give up your spot. We will contact those skiers on the wait list later this week with an update if any spots have opened up. We have now closed the wait list. Thank you to everyone for your interest. If and when any spots come available we will notify people in order. We will provide periodic updates to all those who are on the list. Please note that registration filled up on opening day last year so please get your teams organized and be ready to go at 8am sharp on Saturday December 15. Please consider making use of the bus shuttle ($10) if appropriate. This is especially useful for solo skiers as you can park your car at the finish line in Banff, take the bus to the start of the race and ski back to your waiting car. For those skiers interested in booking a room at the Fairmont Chateau Lake Louise for a night or two before the loppet, we are still waiting to hear back from FCLL about a preferred room rate and booking code. Ice Magic is the same weekend at the FCLL, so rooms book up quickly. Please check back periodically for further news. We have set a tentative date for the 2013 loppet of Sunday January 20th with a backup date of Sunday, January 27th (pending approval from Parks Canada). More photos and Team MitoCanada's race report. Some video from the course too. Plus great post-race video of the backswamp. As coverage allows, we will post photos from the course during the 2012 Lake Louise to Banff Loppet & Relay. The conditions for tomorrows race are excellent. You may wish to run larger baskets, if you have them, to help with softer sections of track. Some slushy sections have been reported close to the rail tracks East of Protection Campground. On Leg 6 after the thin section on Sundance Canyon you will turn left onto Marsh Loop as in previous years. Instead of dropping onto the river at the first bridge we have been able to extend the track to the third bridge so you will drop onto the river later on. This will be clearly signed. The track setting in Lake Louise is looking great, they have set 10 lanes running into 2 for the start. Legs 1-3: Very good snow conditions and trackset entirely. Leg 4: Hillsdale split has been trackset uphill and packed for the downhill. Skiers can take off their skis and run on the road if they wish. Leg 5: Reasonable snow/track along the 1A but it has its usual inconsistencies. Totally skiable. After the Muleshoe rail crossing, the river is lightly snow covered and fast. No slush reported today. The backswamp is in very good condition. Leg 6: Healy Creek Trail is single trackset and has a skating lane. 500 m after exiting the Healy Creek Trail onto the Sundance Canyon paved trail, the snow cover becomes minimal for one km. Skiers can choose to take off their skis and run until the track improves. Upon dropping down onto the Bow River, skiers will again find a classic track and a skating lane to the finish at Central Park. The stars have aligned, snow has fallen and temperatures are rising. The race is on and it's going all the way to Banff! Race start is still 8am and all other details remain the same. Our trail crews will be out frantically setting the last 2 legs of the race over the next few days so keep an eye on the website for course updates as we go. Locals along the 1A search for trailkill. Please ski quickly on Sunday! Pack of 6 wolves near Castle Junction on Friday. Ski quickly but drive slowly. Trail crews were busy on Friday and Saturday machine packing and tracksetting parts of the course. The Hillsdale split (leg 4) was skier and machine packed and it is in better shape than previous years. The LL, Baker Creek and Castle portions are machine set and are in excellent condition (picture taken on leg 2 along "Panorama Ridge" this afternoon). Given the poor snow conditions existing today on the river beyond Muleshoe, in the Backswamp, Healy Creek trail and the Bow River (part of leg 5 and all of 6), we would stop the loppet at Sawback Picnic area (50 km) and divide the course into 6 relay legs. However, we are monitoring this weeks temperature and snow forecast carefully. The cold snap is predicted to break on Wednesday and some new snow is expected throughout the valley. It may be sufficient to improve the last 20 kms of trail. We will make a final decision and post it Wednesday evening. In the meantime, it is never too early to start your training! Recent high winds and warm temperatures over the last week have impacted parts of the course, particularly at the Banff end of the valley. Trail crews are working hard over the next several days packing the snow and checking conditions on the river and backswamp. We'll post an update on Sunday/15th letting you know our progress. The deadline for cancellations with a refund ($35) is January 8. We have more than 40 people on the waiting list so please let us know as soon as possible if you need to cancel your registration. We have reached our cap and registration is now closed. Registration is over three quarters full already. Don't miss out, sign up now and let your friends know. Check out all of the awards plaques to see the previous fastest individuals and teams. We have set a tentative date of January 22 with a backup date of January 29. Registration will open on December 15th. Lots of great videos here including the top 3 solo finishers. More to come. First set of photos posted here. We have some great video to post too. What a great day! "Thank you" to all of the skiers, volunteers and donors for making our loppet a great success. Full results are posted here. Great snow conditions and mild temperatures made for the best conditions in years. However, skiers are reminded that they must at least wear their race bibs. See you next year! Split time results have now been added. Full results are here. Lots of photos will be added over the next few days. Individual and Team results are here. Split times will be posted tomorrow. As coverage allows, we will post photos from the course during the 2011 Lake Louise to Banff Loppet & Relay. Leg 3: Logging road will be signed. There has been some utility maintenance disruption to the track just before Johnston Canyon campground. Follow the signs. Leg 4: Hillsdale Split has too much snow for us to set a track in the ditch. There is sufficient snowmobile packed snow on the shoulder of the road for skiers to ski up the Hillsdale Split. Note: One way vehicle traffic will be approaching you. Vehicles will have been alerted to skiers on the road. We recommend that skiers run down the decent of Hillsdale Split. A track is now set from the east side of Hillsdale Split all the way to Muleshoe rail crossing. After crossing the railway tracks skiers will find the usual snowshoe packed, skier set track into and through the Backswamp to the Sunshine Overpass. Portions of three legs continue to require our attention. Leg 3: After passing through Moose Meadows skiers will come to a dormant logging operation (yes, in a National Park!) where it is impossible for us to set a track for several hundred metres. Skiers should anticipate having to run along the hard packed access road until they approach the railway where they will again pick up the track for their final 2kms to Johnston Canyon campground. Directional signs will be posted. Leg 4: Snow conditions on the Hillsdale Split are making it difficult to set a track. Crews will be working tomorrow to rectify that. It is possible that skiers may need to jog portions of the uphill or downhill sections. Leg 5: The trail was packed yesterday and a track will be set tomorrow to Muleshoe. We will update our website late tomorrow afternoon with the latest information. Leg 1: Lots of snow! The Fairmont tracksetters (Bruce and Jeff) report excellent, cold snow. Parks Canada tracksetters are catching up on all of their trails and plan to set the Tramline and campground trail tomorrow (Friday). Chad (Baker Creek) has set from the level rail crossing in LL to Baker Creek and reports excellent conditions. They have had traces of new snow. Leg 2: Chad has set from Baker Creek to Castle Lookout. Again, excellent conditions. Leg 3: Ed (Castle Mtn) has set from Castle Lookout to Castle Junction and is working at packing and setting from the Junction to Johnston Canyon campground. A little east of the beginning of the leg, there is a hairy descent through tight trees. Caution is called for. As we move east, warmer daytime temps (and minimal new snow since Friday's blast) have deteriorated the snowpack a little. Leg 5: Sawback to Backswamp to Sunshine overpass: track being worked on, Bow River and Backswamp have been snowshoed and skier set. Leg 6: In running across the Sunshine overpass, remember that skiers must carry a set of skis and poles. A two foot wide plywood walkway will be laid down over the cattleguard. Healy Creek trail is having the second track taken out to allow for skating. Appreciate that the trail is crowned and narrow in parts, so it ain't skating at the Nordic Centre! After exiting off the Healy Creek/Sundance trail on to the Bow River, a skating lane and a track is set to the finish line. Please remember that skating anywhere other than on leg 6 is not in keeping with the spirit of the "classic" loppet. Check back on Friday night for another update! Please note that this year we will be holding the pre-race meeting in a new location. The Meeting Room is the Plain of Six Glaciers and Saddleback Room, It is located in the Lower Lobby of the Mount Temple Wing. It’s much larger than the Alpine Room. Please walk to the Mount Temple Wing, Once in the main lobby take the stairs or elevator down to the lower lobby and the meeting room is down the hall, past the business centre. On the river near Muleshoe. No problem with snow coverage this year! Remember your mother saying, "Be careful what you wish for…you might just get it"? Well, we got it! The loppet corridor has had mega snow in the last 48 hours and we will be back out today packing the trail with snowmobiles and snowshoes. Stay tuned! We have the makings of a wonderful loppet! Trail crews have built the snow ramps on and off the river at Muleshoe (leg 5) and report above average snow coverage there and on the Healy Creek trail (leg 6). Beautifully set trails were skied on Sunday at Baker Creek (leg 2). With our special track setting permit expected in the next day or two, packing will begin on the other sections. We have a long waiting list of eager skiers. If you have registered for the race and will not be able to attend you still have until midnight on Sunday, January 9 to cancel and receive a partial ($35 per person) refund. Please email info@loppet.ca as soon as possible if you wish to cancel. We are no longer accepting names for the waitlist. Thank you to everyone for their interest. We will contact everyone who has already added their name in the next few days to advise their status. The 2011 Lake Louise to Banff Loppet & Relay is now full and registration has closed. Don't forget we offer a shuttle bus to the start of the race which will prove particularly useful for solo racers. Make sure you register for this at the same time. Registration opens December 1st at 6am. The tentative date for the 2011 Lake Louise to Banff Loppet & Relay is Sunday, January 23 with a backup date of Sunday, January 30. We will confirm these dates as soon as possible and we anticipate registration going live on December 1. Paul Doyle #67, finished the 72 km at 6:45 pm after his son, Liam Doyle (#52) saw him at the Sunshine Overpass and checked on his status. 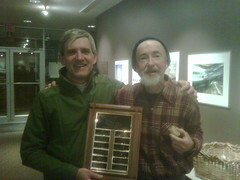 Paul arrived at the Sally Borden at 7:30 and enjoyed a beer and food with loppet volunteers. Jo thought a new category/plaque should be created for the skier with the most stamina. Liam thought otherwise! First photos are posted here. Overall there are very good conditions from the start to Castle Junction (middle of Leg 3). The snow deteriorates in quality and quantity as you ski further east towards Banff. Leg 1 - Great conditions to Baker Creek. Underneath the Trans-Canada Highway the railway has thrown rocks up onto the ski tracks. We advise you to remove skis and walk this section. Leg 2 – Generally good, thin coverage in campground with willows sticking up. Leg 3 – Some thin portions with short icy downhills. Leg 4 – We recommend you walk steep portions of the descent on the Hillsdale Split. Warning sign will be posted at start of descent. Leg 5 - Generally thin cover, deteriorating in last couple of kms along the 1A before you cross the road at Muleshoe and drop into the river and the Backswamp. From the road crossing at Muleshoe to the train tracks we recommend you remove your skis and walk. Reasonably good conditions in the Backswamp. Leg 6 - Trackset (to the best of our abilities) for classic and skating on Healy Creek and on the river to the finish. For the last 2 legs (from Sawback east to Banff) we recommend rock skis if you have them. The course has been trackset and is looking great. Crews will continue to fine tune the trails during the week. We have some recent photos (Jan 19 & Jan 17) of the course here and will try to post more updates as the week progresses. We will be offering a limited gear shuttle this year. At the Chateau registration desk we will accept one bag per skier (gym bag sized, no skis or poles). This will be delivered to the finish line or to the wrap up party at the Banff Centre depending on your choice. Please be considerate as we don't have a lot of room to transport extra gear. This would be particularly useful for solo skiers who are taking the bus shuttle and may be stuck at the start line with their warm up gear. Registration is now closed as we have reached our limit of 160 skiers. Thanks for supporting our loppet! Weekend trail crew warriors have good news to report … we fully anticipate being able to ski the full 71 km to Banff! Crews will reset the track midweek. Weather forecasts indicate a minor cooling trend by the end of the week. Any further changes will be posted here, with a final posting on Friday evening. 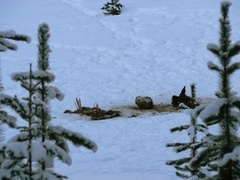 This elk kill was spotted today (Sunday/17) just off the trail on Leg 2. We regret that we will not be able to offer a feed zone at this location. Vegan skiers have objected. Bus Shuttle Note: Please note that the Brewster bus shuttle is a one-way shuttle from Banff to the Chateau. It does not provide any transport to any checkpoints other than the start of the loppet (beginning of Leg 1). If you are racing on a team you will require your own transportation for the exchange points. Recent warm temperatures throughout the Bow Valley have made loppet organizers and skiers alike all a little twitchy. Our trail crews will be out this weekend tracksetting and assessing the condition of the trails, river crossings and the backswamp area. With this first-hand information, we will provide an update on Sunday evening/17th. Think cold, think snow! It's filling up fast folks. We have 21 solo participants and 15 teams registered so far. It takes a lot of great people to sponsor a race like this. Check out all the companies that support us with prizes and services in kind. We are very excited to announce that we will be offering a Brewster shuttle bus to all skiers. This bus departs from Central Park in Banff (located across from the Post Office and at the finish line - free parking all day) at 6:00AM on race day, dropping skiers off at the Chateau at 7:00 AM. The cost of the bus is $10 (non refundable) per person and must be paid for during registration. Added Latest News page. You can access it from the menu under "Details". The most recent news will continue to appear on the main page but the complete history is available on the Latest News page along with Twitter updates. Follow us on Twitter for updates on the race preparations. On race day itself we will be posting live updates and photos as events unfold. Registration is now open at Zone4. The 2010 Lake Louise to Banff Loppet & Relay will be held on January 24 with a backup date of January 31. Registration will open in November. We have lots of great photos from the 2009 loppet. Check them out here. For full results please check here.